Kerabol Biotin is a complementary feeding stuff developed to contribute to healthy hooves and coat in horses. It contains a combination of D-biotin, DL-methionine (organic sulphur source), readily assimilated chelated zinc, manganese (IPALIGO® trace elements) and selenium (Sel-Plex®). 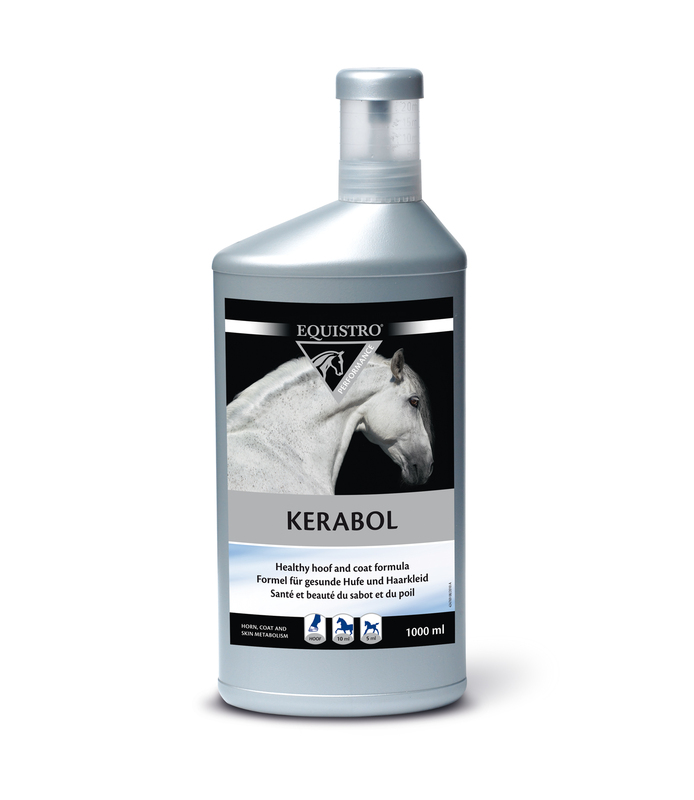 Kerabol Biotin promotes both a healthy hoof (supple without crumbling or brittleness) as well as a bright shiny coat. Kerabol Biotin is a complementary feed. It is available in: 1 kg (Days of supply: 66 days). COMPOSITION: Dextrose, Lactose. ADDITIVES/KG: Composed of trace elements: Zinc (zinc chelate of amino acids hydrate) (E6) 6650 mg, Manganese (manganese chelate of amino acids hydrate) (E5) 2000 mg, Selenium (organic form from an inactivated selenium yeast -saccharomyces cerevisiae CNCM I-3060) (E3b8.10) 16 mg. Amino acids and salts: DL-Methionine technically pure (3c301) 334900 mg. Vitamins and pro-vitamins: D-(+)-biotin 1300 mg. ANALYTICAL CONSTITUENTS: Crude protein 21%, Crude ash 12%, Moisture 7%, Ash insoluble in HCl 6.5%, Sodium 1%, Crude fibre 0.3%, Crude fat 0.3%. • Horses (500 kg): 15 g (1 scoop containing 20 mg D-biotin) per day. • Foals/ponies: 7.5g (½ scoop containing 10 mg D-biotin) per day. Add to the usual feed. It is recommended that KERABOL BIOTIN should be continuously supplemented at the full rate in horses with severe hoof horn disorders for at least 6 months. N.B. Due to the presence of trace elements with maximum set limits, administration must not exceed 200 g/ 500 kg horse/ day.